Osaka Central Telegraph Office (大阪中央電信局, Osaka Chuo Denshin Kyoku). 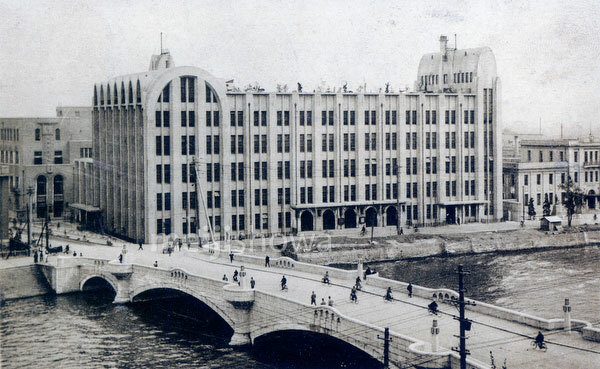 Located at Dojima 3-chome, in Kita-ku, Osaka, the building was completed in 1927 (Showa 2) and torn down in 1966 (Showa 41). It was designed by Japanese architect Mamoru Yamada (山田守, 1894-1966). The bridge in front is Taminobashi (田蓑橋), crossing Dojimagawa River (堂島川).